Brighton & Hove Albion boss Chris Hughton. Picture by PW Sporting Photography. Brighton & Hove Albion boss Chris Hughton called Albion's 5-0 Premier League thrashing by Bournemouth their 'worst defeat and performance' during his tenure at the club. Goals from Dan Gosling, Ryan Fraser, David Brooks, Callum Wilson, and Junior Stanislas consigned the Seagulls to their biggest ever loss in the Premier League. 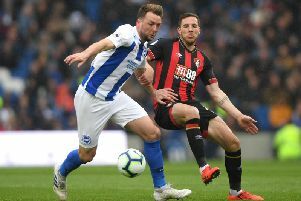 After a chastising defeat, Hughton put the poor display down to a lack of confidence in front of goal as well as being unable to contend with Bournemouth on the break. He said: "I thought we started the game OK. I think a lack of confidence in the final third is stopping us from getting the goals that we need, particularly the goals to go ahead. Perhaps we need a couple of scruffy goals. "I don't think we played well enough when they took the lead to look like scoring. "From our possession, six or seven passes, they score. It ended up being the story of the game. Four of the goals they scored were from our possession. "They countered very quickly and this was a day where we found it incredibly difficult and we weren't able to handle the pace that they had on the counter. "We have to take this on the chin. It's our worst defeat and our worst overall performance." Albion now face a crunch game at the Amex on Tuesday evening (7:45pm kick-off) as they take on 18th-placed Cardiff City. Victory is a must for the Seagulls, as they face a run-in that includes trips to Spurs and Arsenal before facing Manchester City in the final game of the season. A win would move Brighton eight points clear of the Welsh club and Hughton is expecting a positive reaction from his squad. He added: "You never know what type of the performance you will get, but there is no doubt that they know how poor the performance was today. "We have a game on Tuesday night here and everybody will be looking to see the type of reaction I get from the team. "We have no choice but to be better than how we played against Bournemouth because we will have a motivated Cardiff team that will come here Tuesday night."